The Cryo 6 Cold Air Device is a revolutionary skin cooling system that represents a major advancement over comparable methods. In contrast to other options, such as ice packs and contact cooling, the Cryo 6 system can be used at any time during an aesthetic procedure and it will not interfere with the laser beam. 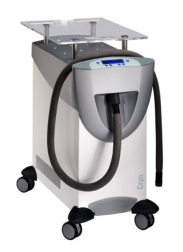 That means you can use the Cryo 6 before, during or after a cosmetic laser procedure to reduce pain and protect the patient from thermal injury, and it can also be used for pain relief from injections. SunRayLaser.com has the Cryo 6 chiller for sale at the lowest price you will find online. We only sell the highest quality refurbished cosmetic equipment available, and we provide a full satisfaction guarantee for your peace of mind. If you are looking for the lowest price on a used Cryo 6 Cold Air Device, simply call our toll-free number or fill out the quick contact form and we’ll provide a Cryo 6 price quote with absolutely no obligation at all. Treatment tube length: 6 ft.